Motivated to leave the screen and communicate using the physical properties of objects and materials, we developed a series of computational kinetics. 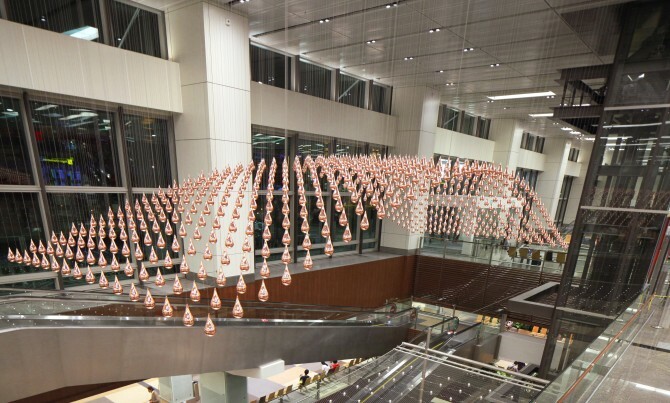 Each element of the kinetic sculptures and installations is bound into complex, collective motion that turns the composition into a real-space sense experience. While spatial communication with new media manifested itself particularly in reactive and interactive screens as well as projections onto objects and architecture with virtual, animated content in the 90s and early 00s, it underwent notable changes by the mid-00s. 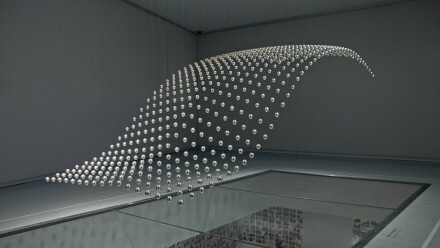 Duality (2006) embodies the transition from screen to materials and moving physical objects by combing two levels: the virtual and the physical. 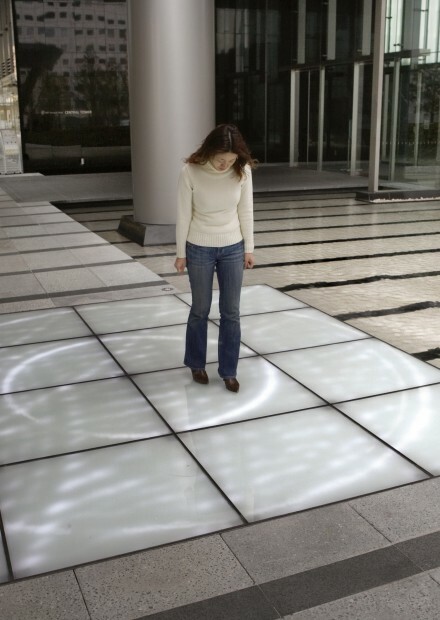 The installation consists of both a screen displaying virtual waves triggered by the footsteps of passers-by, as well as real waves in a water pool. The movement of the virtual water is carried forward as movement in the real water. The location is a covered passageway connecting the metro station, Ōsaki, in the heart of Tokyo, with a building complex. 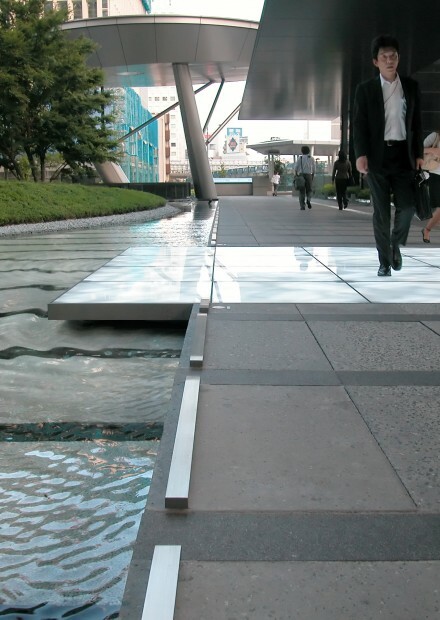 The passageway is bordered on one side by a shallow pool. 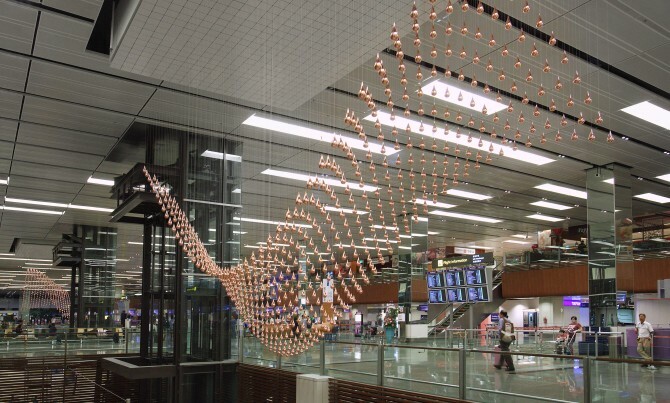 The installation was to be site-specific and reactive. The idea of using the water was quickly developed. We built a system based on load cells in order to detect the footfall points of the passers-by, from which the virtual waves emanate. Foot positions and impact energy are determined with four load cells per glass plate. 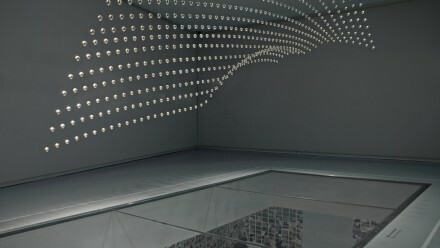 Under the sandblasted glass plates a grid of white LEDs produces virtual waves. Then the real challenge was producing controllable waves in the water. Tests with actuators, which produce controlled waves when hitting the water surface, yielded convincing results; in the final installation they are so precisely controlled that the impression of light waves continuing as water waves is achieved. 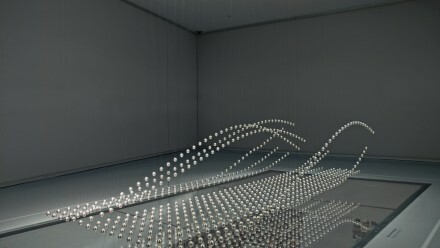 The Grasp Pendulum (2009) follows a similar approach — virtual movement transferred into real movement. The installation presents the three most important variants of grip: animated hands interact with one another on screens mounted on pendulums, with virtual hands seeming to control the swing of the pendulum. From this conceptual joining of the virtual and physical, we developed a choreographed narrative that unfurled a strong performative presence in the space. 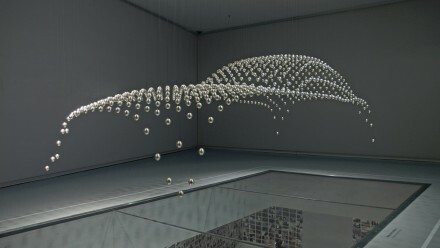 Kinetic Sculpture (2008) for the new BMW Museum went a step further: from virtual pixels to physical voxels. Rather than working with screens, we designed a new kind of dynamic interface that could represent three-dimensional forms. In search of a representative form for a pictorial narrative that described a design process, we developed the idea of choreographing shapes in space within a dynamic plane. 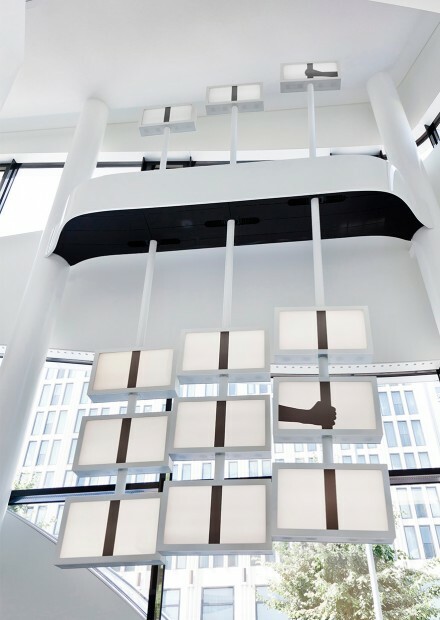 Simulated systems made of a metal grid suspended from the ceiling with metal strips showed that such materials would not offer enough three-dimensionality. The same applied to small spheres connected to each other. Only free-hanging metal spheres, which could be individually raised and lowered on a vertical plane of several metres, could be configured into the forms we wanted to communicate. Important lessons were gleaned from the prototype that was then built concerning both the hardware — the stepper motors, the size and weight of the balls, etc. — and also the approach to the choreography of forms. For the final design of the metaphorical narrative it was was crucial to see the spheres moving in real space rather than just on a screen. The aim was not the invention of a new three-dimensional display that could represent all possible forms, but a system with uniformity in design of content and display. 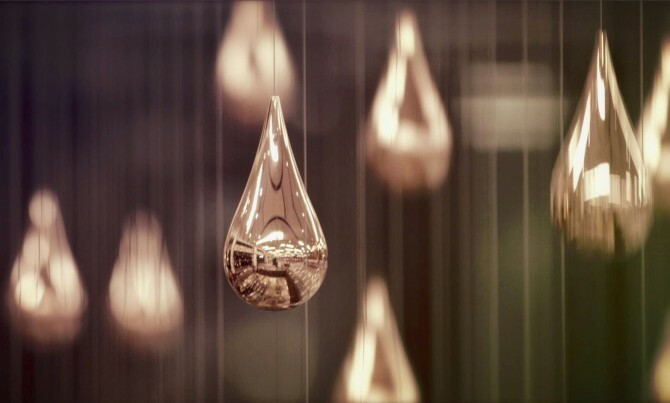 The same applied to the Kinetic Rain (2012) installation, which was based on a principle similar to Kinetic Sculpture, but made reference in form and content to its specific location. Kinetic Logo (2011) reached maximum kinetic complexity. 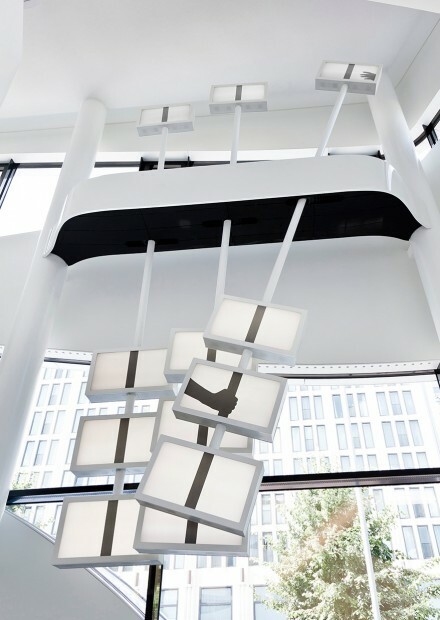 The idea was to deconstruct and set the Deutsche Bank logo in a kinetic sculpture, so that the image would be visible only from one specific location and only at particular moments in a choreographed sequence. For this, the logo’s central rhomboid was divided into 48 identical triangular elements, each connected to a motor by six threads that can be moved on one vertical and two horizontal axes. 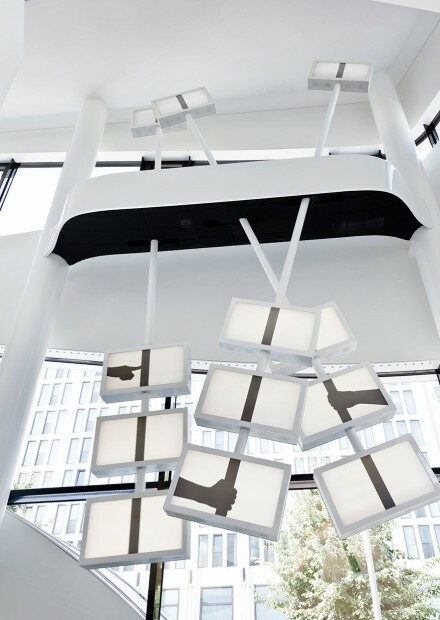 The complex design meant the elements could be tilted individually on three axes into various forms that could be used for video projection mapping. To prevent the projections reaching past the triangular elements and onto the floor, the elements were masked in real time. The generatively produced content that is projected onto the triangular elements responds to their positions. Visuals flow in a physically correct manner depending on the respective inclination of the elements. 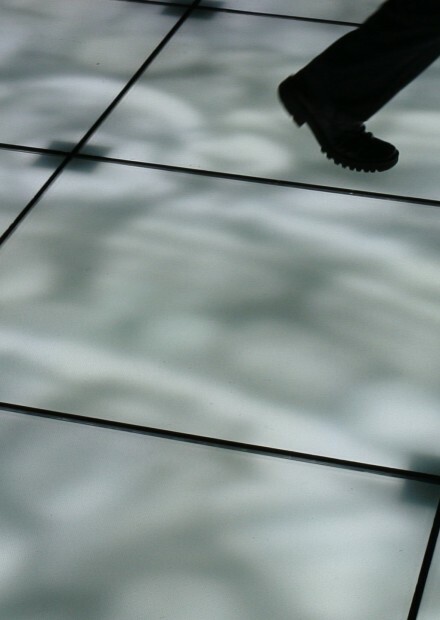 Through tests with the prototype we finally realised that the shadows cast on the floor by the triangles could be used as another means of expression, and integrated a choreographed light sequence. Symphonie Cinétique (2013) brought together five kinetic works that have been developed between 2008 and 2013. 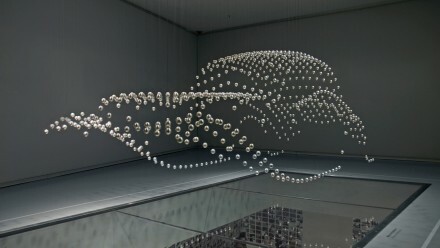 The artworks in the exhibition were prototypes of large kinetic installations that were realised in this period. While the narrative range of the sculptures is limited, their strength lies in the poetry of the choreography. The flowing movement of three-dimensional images constantly shifting into new forms has strong associative power. 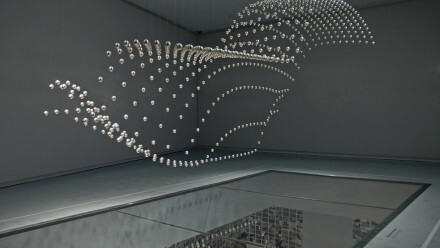 The aura of these kinetics lies primarily in the computational design that binds each element into complex, collective motion, and pulls the total composition into a real-space sense experience.